What is the most obscure FP brand that you can think of? Thread: What is the most obscure FP brand that you can think of? Re: What is the most obscure FP brand that you can think of? Jon, I know for a fact that's a Szant-O-Matic pen and pencil set. Only two sets were made before the California company failed due to a mixup in celluloid ingredients causing the other set to spontaneously combust, in turn resulting in a fire that burned half the town to the ground. How's your set doing? BTW, I finally did a deep FB search and found the thread where some of the pen cognoscenti weighed in on that set. There was no easy way to export the thread but I'll pull the images and salient text and repost here later. Just a post-script on my image of the "No-name" and a response regarding why this can be so fun... and the value of having a wide net. When I got these a couple years back I posted in a couple places, people thought they were cool, but there was one Facebook pen forum that had just the right people to chime in. Took me a while to find the thread but I'll pair some images with the comments they made. It really takes the detective work to another level and make it interesting in new ways (and, of course, you can always just be owning a POS pen). "A custom order and made by Swan . You have similar pens with same clip, lever ,shape and plastic, with Swan imprint and also with Monogram or Belmont imprint for the Rexall stores .On the left you have a Mogram set and on the right a Swan pen." " The plastic is most often associated with Eagle - which made Monogram and Belmont pens for a time. I've got a Michael-George, a Belmont and an Eagle compared in this article." "Mabie Todd towards the end used that same clip and plastic. I don't have any photos of Swans with two cap bands though. All that means very little, by the end of US Mabie Todd, I doubt they were making their own components and were probably buying them from the same place this company did. Camel also used this plastic"
"Conklin Nozac and Camel parts - I don't have a cap for the Conklin, so was thinking of trying to make one from the Camel. The Conklin cap pictured was for size. A lot more ambition than capability." "Color is not perfectly accurate but you get the idea..."
The rest of the thread involved somewhat tangential topics, mostly relating to the difficulty of pinning down exact names on colors/patterns. Some of these objects were originally termed by fairly vanilla labels, like "Brown", and various other names have come into play. The dedicated collectors know all these details... or keep at it as much as they can! I hope this has been of interest, especially in furthering Will's initial reasons for posting: that objet obscur du désir can certainly be worth obtaining. Is there any way to directly upload an image without using a hosting site? I have pictures of The Wembley pen to post. This obscure little number was already way out of date and obsolete when it came on to the market. It is a slender BCHR eye dropper pen. Click on "go advanced", then "Manage Attachments", Browse - select your file, upload and at the bottom of the box you will see add... I have just done it with this relatively obscure Swan - a silver split lever from 1919 - the only year that they were made. Vive les chevaliers! A bas les têtes rondes! That's a wonderful pen with a glorious stub. Envy. I had a one off pen made by a NY inventor. This was a lever filled pen, early 50s. The pen and nib were quite short, the cap was in two parts, one sleeve had a glass container the idea being that you could fill the pen whilst travelling. I found the patent for the pen and later offered the pen to the descendants of the inventor, not interested. The design fault was that you could not fit the nib into the narrow neck of the glass bottle, which in any case only held around 1-2ml. the Pickwick, the Owl and the Waverley Pen." The Harris pen is fairly obscure. Or at least I do not come across them very often. This model is a 1927 Harris University pen. It was, as its name suggests, aimed at students. The cap jewel unscrews and can be replaced with a different to reflect what colour ink is in the pen. I rebuilt this pen with parts from two identical pens and have kept the scrap in my pieces box. Last edited by carlos.q; August 4th, 2018 at 12:30 PM. Are Summit pens obscure? I never see anyone discuss them. The pen at the bottom is a lever filled 1940 model. The one at the top is a 1930s bulb filler. 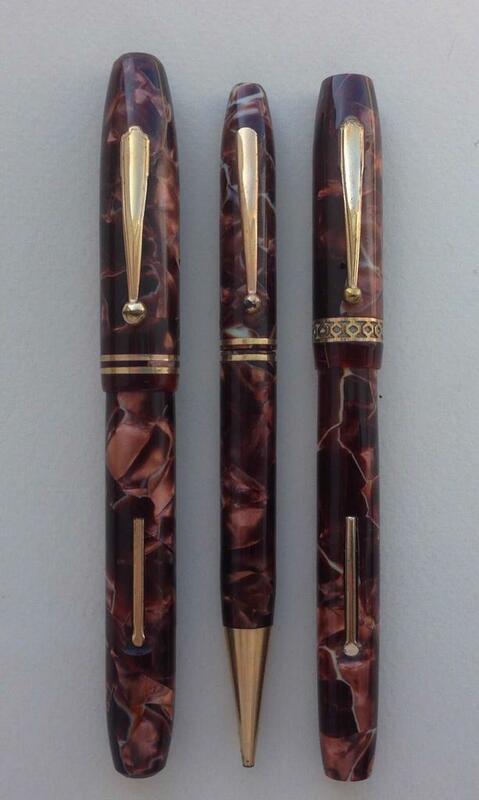 These pens are characterized by being heavily chaised. Summits are not at all obscure in the UK but are probably not well known elsewhere. I have seen one or two Summit pens, but I don't remember the chasing being their distinctive feature. Love those two pens, btw. Let's swing to Italian pens. 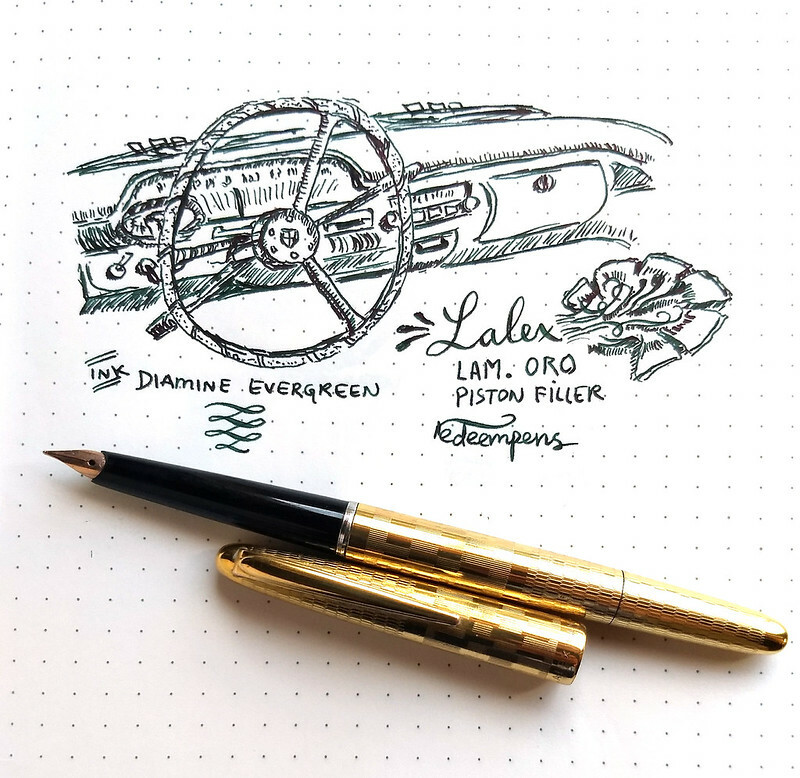 This is a vintage Lalex pen. I don't know if it has a specific model number, but it's marked Lam. Oro (Laminato Oro, or "gold-laminated" in English). Look at the chasing pattern on the gold. I think it's very cool. The interesting part is that, for a pen that looks like a C/C filler, it actually has a fully functioning (albeit small) piston filling system. 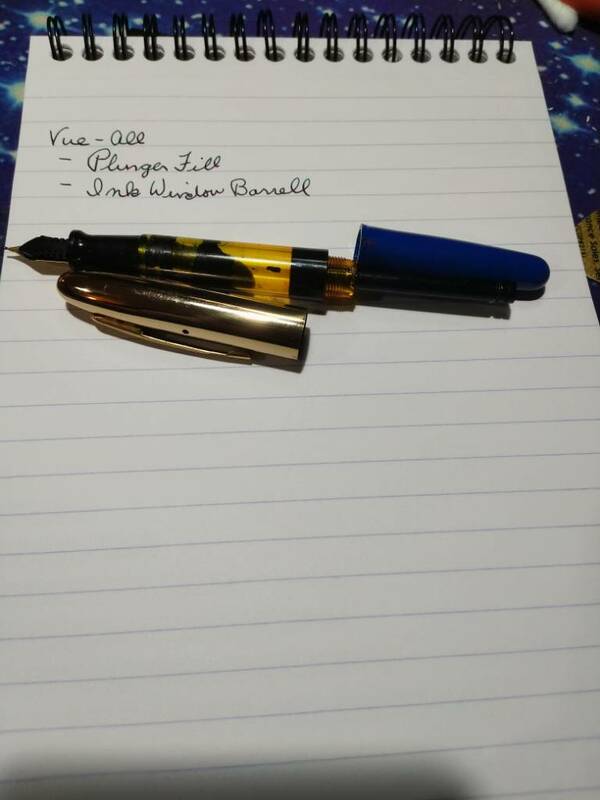 I cleaned it up, put some silicone grease to improve the suction and the pen fills with water (and ink) once more. Vue-All. It's my latest acquisition. Lighting isn't great, but here's an extremely rare Rex, a German pen, in excellent condition. 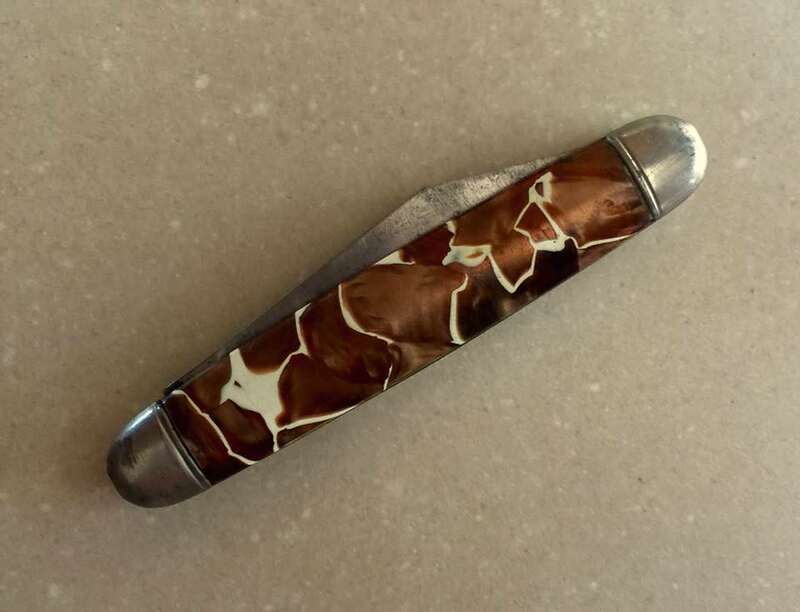 I plucked this from a table at the DC pen show two days ago. I haven't tried writing with it yet. Above: LUS Giubileo Scuola with adjustable steel nib. Student version of the Giubileo 53. Below: Lincoln Giubileo Esport. Very similar to the Scuola. Not sure if this was a sub-brand, OEM version, or a knock-off. I have had a few Langs-made National Security pens that had the same chasing as yours. This kind of chasing is called Guilloché or "Engine Turning". It is unfortunate that I do not have a good camera/light set up so that I could show off just how pretty it is. Yes, it is attractive - very similar to the chasing found on post-war black Onotos - which is known as "barley corn"